Working with poet AB Jackson, COCOA has developed the beginnings of a specialised vocabulary for the Castlegate Quarter of Sheffield – using language to ‘shine a light’ on details of the urban landscape that might otherwise go overlooked. This glossary will be updated with new words as our project develops, enriching our experience of the area and helping us to look more closely at familiar territory. Contributions to the Castlegate glossary are very welcome – please send us your own new words via the comments box below. aqualaction, n. Milky discolouration observed at the confluence point of the rivers Sheaf and Don, at the point where the Sheaf emerges from the ‘Megatron’ conduit (see also waterverge). carnscenty, adj. Relating to the unpleasant odour of raw meat, reputed to have been prevalent on warmer days around the abattoirs of Castlegate. 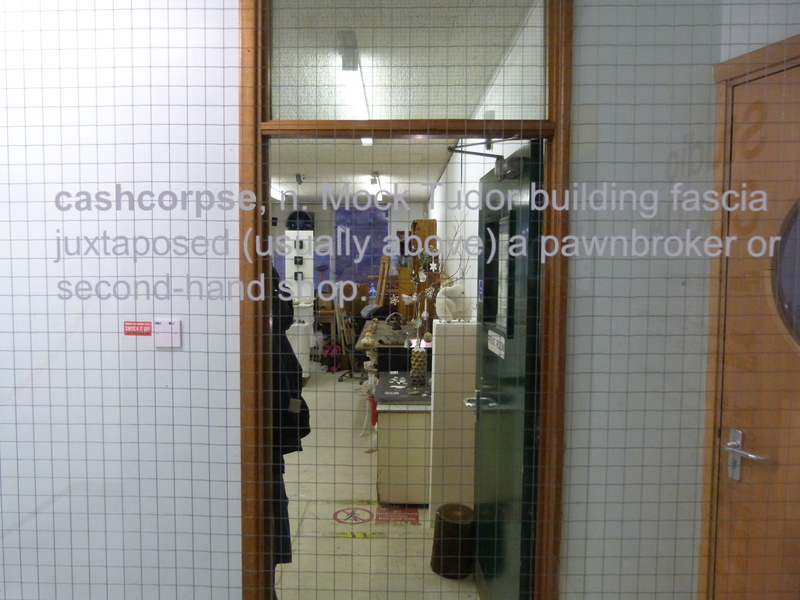 cashcorpse, n. Mock Tudor building fascia juxtaposed (usually above) a pawnbroker or second-hand shop. castermongers, n. Dispossessed traders of Castle Market; itinerant traders selling motley items that purchasers might never have known they needed (e.g. odd shoes). Considered to be essential to the spiritual life of Castlegate. coddlement, n. A general term which refers to the architecture, signage and window displays of fish and chip shops. consheet, n. Mass-produced, textured concrete of the kind commonly seen on the facades of modern police stations, e.g. South Yorkshire Police Station at Snig Hill in Sheffield. Not to be confused with rap sheet as belonging to a con. filodystopia, n. A disappointing pastry bought from a chain-store vendor that has replaced an independent bakery. firtle, n. Small mammal that nests in the Don riverbank. It has adapted to urban living by constructing nests from old plastic bottles, which act as a solar heat trap. This strategy has allowed the firtle to extend its breeding season and, because it now raises two litters a year, the firtle is threatening to overrun South Yorkshire’s waterways. foambox, n. A wall mounted box-like structure of unknown purpose or function marked with the word ‘FOAM’. longtails, n. Abandoned property owners or pension fund speculators who do not care for their buildings and are only interested in land values (trad. derived from fairground showman’s vernacular term for rats). Mary Poppet, n. Wax effigy of Mary, Queen of Scots (aka Mary Stuart), said to have been used in folk remedies. monochausse, n. Single shoe, occasionally observed suspended from an overhead telegraph wire (a monchausse pendant) or on a costermonger’s stall. nubble, n. A disturbance on the surface of a fast-flowing river caused by a rock or boulder below the surface. Variant (orig. Devon? ): slubberbubble, n.
nowhere stair, n. A general term referring to a flight (or flights) of stairs leading up to a disused or demolished floor (or floors) of a redundant building. prongers, n. Narrow metal spikes attached to the external ledges of buildings in order to deter pigeons from roosting thereon. Variant (Scot. ): doo needles, n.
Reetart, n. Fine Art (local antonym to Street Art). resh, n. (pl. reshes) A reddish or rusty-looking stain on the external stonework of public buildings, often caused by damaged drains. Hence, reshy, adj. sarniculum, n. Ornate spout of a public water fountain. sarnious, adj. Relating to a river that runs underground (possibly from Welsh sarn, a causeway). Or fig., relating to a person with dark secrets. Scary Mary, n. Apparition of ‘the Scottish Queen’ (aka Mary, Queen of Scots or Mary Stuart), said to have haunted the site of Sheffield Castle since her imprisonment during the late 1500s. sheafdraught, n. Cold air current emanating from the Megatron culvert that carries the course of the River Sheaf beneath Castlegate. solweed, n. Small, lone representative of an invasive species of flora, often encountered in shady corners (also know as weeweed). Strangle, n. (Partial anagram of Angel Street) parlour game played with letters from signs with missing type e.g. the Sheffield CO-OP sign on Castle House which reads: S e fie O- elcomes ou to t e city. ticktile, n. & adj. 1. A form of glazed brick, in a variety of shades (usually browns, ochres, oranges, caramels) as found, for example, in the construction of Castle House (c. 1900) in Sheffield. 2. adj. The feeling associated with holding small, sharp objects, such as pins or nails or the prickly fruit of the horse-chestnut. thrampers, n. Heavy cider drinkers employed to use threatening behaviour in order to discourage people from leaping into the canal at Victoria Keys. Wainmeat, n. Famed one hundred year old leg of lamb that once hung over a butcher’s stall in Castle Market (also know as The Wellung). waterverge, n. The point at which two rivers meet in confluence, e.g. the Sheaf and the Don at Castlegate in Sheffield. Related: verginicity, n. See also: soupswirl, n. (in hydrology or cookery). With thanks to Lizzie Alegaswaren, AB Jackson, Rosa Kennedy, Sorcha Noble, Alan Peters, Steve Pool, Cassie Limb, Sue Taylor, Trish O’Shea, Vanessa Toulmin and Natasha Withington. The following extensions to our Castlegate Glossary were inspired by our Cocoa Canal Cruise on 13th September 2015. Coined by the artist and sculptor Anthony Bennett, these fine new words contain echoes of Black Country dialect and connect the unique vernacular relating to the waterways of the West Midlands with references to the South Yorkshire canal system. bawk, n. coloq for burblewake: the effect of larp on adjacent materials, such as jebbo or wort, a microtide. Hence wubbock (short for wortbawk). ebbo, n. coloq. for eddybobble: the movement made by floating objects, such as jebbo (hence ebbojebbo), when subject to a restricted flow of water. farm, n. coloq. for fagsam: organic material or wort subjected to abrasion due to the movement of water against the walls of the waterway. jebbo, n. coloq. for jetbot: a floating bottle or sealed container which has been discarded and has ended up in a waterway. larp, n. coloq. for labrip: the sudden disturbance and resultant rippling motion of water caused by the mouths of fish as they consume foodstuffs at the surface. lizzo, n. coloq. for limbsop: broken branches and twigs which have fallen into a waterway and have become sodden. Colloquial synonym for ‘nuisance’ or ‘irritation’. sludgy, n. coloq. for sluiceboogie: the dance like motion of jebbo when trapped in a forceful circulating alluvium or cascade of water, emanating from an ‘outlet’ in the wall of the waterway. spew, n. coloq. for lockspume: discoloured aerated foam produced when a canal lock evacuates water, as lock levels are manipulated. wort, n. coloq for wellmatta or whelm matter: floating organic matter which has become soaked, and has conglomerated into a buoyant mass, which gathers and harbours in clefts, natural and manmade along the waterway.